What’s the best way to ship my bike? How do I find a reliable motorcycle shipper? What do I look for and what should I ask about? 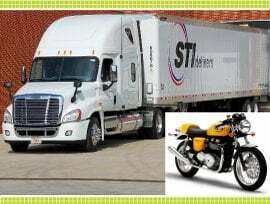 Choosing the right motorcycle shipping company may seem like a daunting task but it’s not as hard as you might think. Ask any of your rider friends if they have ever had to ship a bike and who did they use? Check out the different motorcycle rider publications. Go on line. Check out some of the rider forums. Call some dealerships. Simply entering “motorcycle shippers” into your browser will provide dozens of hits. The internet is an invaluable source, use it. Finding a shipper isn’t that hard. Knowing who can do it right, takes a little research. Cheap motorcycle shipping could be available, but it may not always be the right choice. How do I know if I’m choosing the right shipper? Here are some questions you need to ask. How will my bike be transported? The first question that everyone asks is how much? That’s a great question and no doubt important but the most important question should be, “How are you going to transport my bike?” Remember, you get what you pay for. The best deal may not be what’s best for your bike. Find out the type of vehicle your bike will be transported on. Some carriers use open air transporters with no protection against the elements. There are some size restrictions as well with most transporters, some large motorcycles won’t fit on the trucks properly. A true enthusiast will want his/her baby transported fully enclosed. The last thing you want is your bike to be delivered looking like it just spent 2 weeks on the open road. How is my bike going to be secured? Some companies double stack. You probably don’t want your bike being dripped on by the leaky old beater on the top rack. Some companies load bikes side by side without using special skids or hardware to create a safety zone around the bike to help protect it during transport. A strapping failure on any bike on a load like this could lead to damage on the surrounding bikes, maybe yours. What do I do to prepare the bike for transport? Some companies require that the fluids be drained. A good company requires nothing more than a signature upon pickup and delivery. Most companies will provide an estimated time frame for pickup and delivery of your bike. Total transit time will depend on the service you are provided. Something to keep in mind is all shipping companies have a “plan” in place to make shipping affordable for you and profitable for them. What does this mean? Most carriers cannot offer on day pickup or delivery. Some do and it never hurts to ask. But you may have to show a little flexibility with your schedule. Verify the transporters credentials. Be sure the carrier can provide proper licensing, valuation coverage and operating authority. This information should be easily provided. If not, keep shopping. How much you should pay depends on the level of service you require. If you’re shipping a salvage bike you may not mind if it’s loaded onto an open air truck. If it’s open transport, you should get a better deal. If you’re looking for fully covered transport, expect to pay a little more to keep your bike a bit cleaner and safer. When shopping for a shipper, make sure the quote you receive is “all inclusive” and that there are no hidden costs, residential fees, taxes, fuel charges etc. Some companies may charge extra to load the bike at your door. Ask about group discounts if you’re going with a group. If you’re going solo, ask about round trip discounts. Cheap motorcycle shipping can be a reality, just make sure your price is real. Make a list of all the questions you want to ask beforehand and be sure you jot down all the answers. Do this for each company you’re considering. Now, here’s a little advice. Don’t ask all your questions at once and here’s why. You want to test the customer service. Call them back. Did they answer right away? If you had to leave a message, was your call returned promptly? Now that you have them on the phone, ask a few more questions. Are you getting clear and concise information? Re-ask a question or two from the first time you called. Are you getting consistent information? If the phone service you are receiving is not top quality, the shipping service may not be either. Okay, I’m about ready to choose. What else can I do to assure top notch service? Well, you read the feedback on each company’s website right? Great, now keeping all that feedback in mind sit down at your computer and enter each companies name into your browser followed by the word “complaints”. Because you can’t make everybody happy, no one will be spotless. In the case of one lady, (and this is a true story) she called to complain that the drivers would not carry her Harley Davidson Softail out of her living room and down a flight of stairs. In fact if you can’t find a complaint about a company, they probably haven’t been in business very long. You will find out quickly who has experience, who is naughty and who is nice. Following this simple advice can save you hours of frustration and added days or even weeks to your motorcycle shipment. Happy shipping and as always, RIDE SAFE!